If you’re a parent of a teenager, then you’ve probably forked over a $20 bill numerous times for your kids to enjoy a movie, a shopping trip, or dinner with friends. Most teenagers are stuck between a place of wanting independence and still needing to rely on you for money. As the parent, you might also feel stuck, as you realize your teen can’t make a lot of money yet, and you don’t want to ruin your budget on their wants. When you’re 16 and everyone has the latest cellphone, laptop, or clothes, it’s easy to feel like you “need” those things, too. 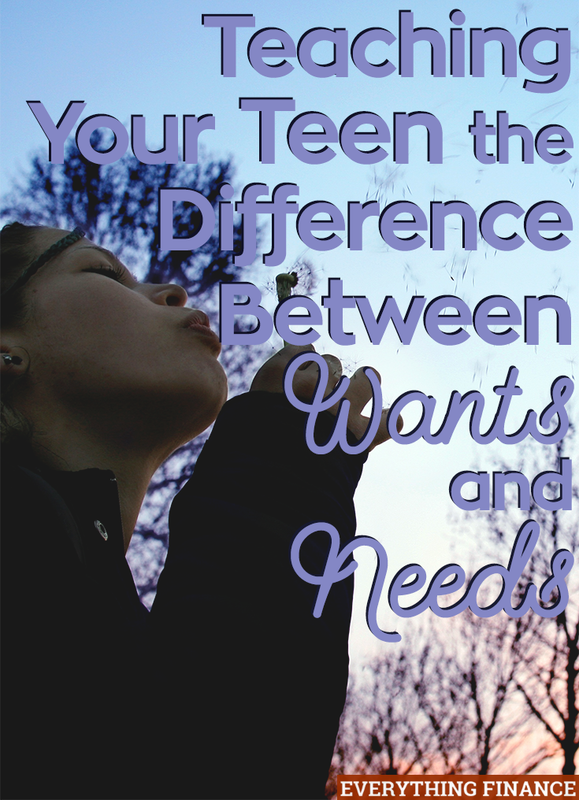 In fact, most teens consider wants as “needs,” especially when they aren’t footing the bill. That’s why it’s so important to teach them the difference between wants and needs now. Here’s how you can! The way to teach your teens the difference between wants and needs is to have heart to heart talks with them. Don’t just blow off your daughter’s whiny requests for that $450 prom dress or your son’s continual asking for the $250 special edition basketball shoes. There might be a bigger issue behind their outward materialism. Perhaps your daughter is feeling ugly and unwanted by the boys in high school, or your son is dealing with bullying issues from his basketball teammates. They think they need these material possessions to fit in, but what they really need is love and sound advice from you. Taking time to talk it out with them might help them realize what they need to do in their situation. If your teen continually struggles with wanting items, try doing fun volunteer work as a family by helping others less fortunate. The local homeless shelters and churches are a great place to start. If you’re feeling adventurous, traveling to a new destination to build houses is also a wonderful way to help others. As a teen, I went to Mexico three times to build houses for the needy. What we built these families would be considered a shack or garden shed in America, yet the families were overjoyed. It was an amazing experience to realize how little others had and to be happy with what you’re blessed with. It was a lesson that had to be experienced, because I wouldn’t have understood this if it were lectured to me. There was one time I wanted to go to Mexico with several friends to build houses, but I also wanted a new bedspread. My mother was wise to tell me to pick which one I wanted instead of giving me both. They each cost around $80, and I chose the new comforter, even though it wasn’t a true need. I regretted it when my friends came back talking about the awesome experience they had. I missed out on helping others and making memories. Again, this was a lesson I learned through experience. My mother could have easily said, “I can only afford one option, and sending you to help in Mexico would be the wiser financial decision,” but she didn’t. I was the type of teen that would’ve gone to Mexico and come back whining about the comforter. All this to say, sometimes you need to let your teen choose the wrong choice or purchase in life to help them realize that there are natural consequences for not being wise. Parents, how do you teach your kids the difference between wants and needs? How did you learn the difference when you were a teen?